Have you ever been treated like a VIP? No? Never? Well, it’s time that you were, and when you’re looking for a ‘car service near me,’ then you may only be concerned with someone being able to pick you up on time and get you to your destination on time. Well, that’s not all you should be concerned about. Yes, that’s important, but when you’re paying good money for something as simple as a Black Car Service Pittsburgh and Town Car service, you should still be treated like you are the most important person in the world at that moment. We’ve been helping people get the best black car service throughout Pittsburgh. In fact, we’ve been doing this for more than two decades. As you well know, a business doesn’t last long if it isn’t dedicated to the best customer service and support at all times. We understand the importance of on-time service (reliability) and safety. We hire only the safest drivers and maintain only late model vehicles in our fleet. When professionals call on us for a corporate car service. They know they’ll be met with a late model, luxurious, clean vehicle in which they’ll be able to work, make phone calls, or simply relax. It’s all up to you. What to expect from our Town Car service. To be picked up on time. To have the chauffeur help you with luggage. To have the door opened for you. To be given privacy, if you wish. To have questions answered (about the area, places to visit, or anything else). To feel comfortable and safe. To reach your destination on time (regardless of traffic accidents or other delays). Doesn’t that sound like some of the things a VIP enjoys? Yes, they are, and that’s just one of the many reasons why we would be honored to have the opportunity to take you to whatever destination you have in mind, be it a business meeting, the airport, a restaurant, or anywhere else. With all that stressful tension being accumulated in just one productive and a busy day, you deserve to get into a fine automobile and unwind yourself, while letting professionals think about the transit aspect of it all, at least. Town Car Service in Pittsburgh allows you to have such a privilege and the satisfaction, and that is for a very affordable price. You will definitely get the VIP treatment you earned for yourself. You surely deserve the service which such a respected company has been providing its customers with, so elegantly for more than two decades now. Traffic jams, finding a parking spot, long distances – all of that can be exhaustive and hectic, especially when your mind is wrapped around a different kind of problem or a task. It has been proven that safe driving, that is – an active participation in the city`s traffic. Which in a lot of situations turns out to be dense, is being threatened by other problems that occupy the driver`s attention simultaneously. And vice versa – in most cases, you cannot solve the problem you are facing while being occupied with what is going in the traffic. That is why, for example, you may reach out to the Car Service Near Me. And book yourself a smooth and yet an affordable ride. Where you can relax and focus your attention on what is important to you at the moment. Yes, it does feel like flying, when you are using the service of an Airport Transportation in Pittsburgh. And being driven by one of their perfectly trained and skilled drivers, in one of their fly and top notch town cars which are in perfect shape. Indeed. The fleet being offered at all times has some very impressive models of vehicles included. And believe it. You cannot be disappointed with the quality of a ride when it comes to the company`s drives. As they are the best in their job, experienced, very disciplined and skillful. For more then a few decades of the company`s existence and doing business. There never was a situation where one of the clients did not make it to her flight because of the mistake on the behalf of the company. Airport Town Car Service in Pittsburgh always drives according to the sealed schedule. This particular car service is very special as for taking the customer`s demands and needs as a top priority. For offering a flawless service and a remarkably personalized experience. Make sure to experience the difference any time soon! 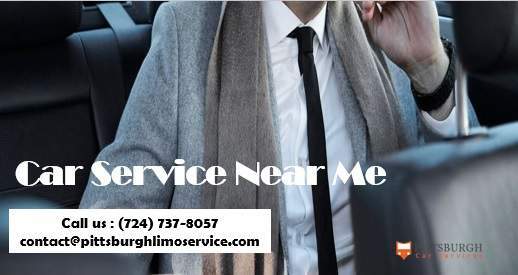 Call us first when you’re searching for a ‘car service near me.’Pittsburghlimoservice.com provides the best Corporate Car Service, Cheap Car Service and Airport Car Service selection nationwide! Get free quotes now!